Helps support the nervous system. 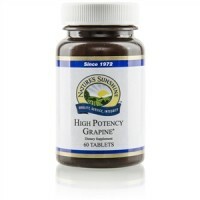 Provides 20 mg proanthocyanidins per tablet. 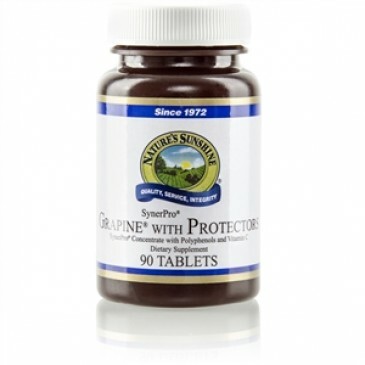 Grapine is derived from grape seed and maritime pine bark. 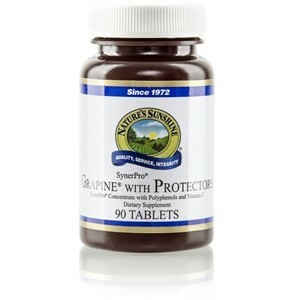 Studies have shown that the proanthocyanidins in Grapine are much more powerful antioxidants than other popular choices. Proanthocyanidins are similar to compounds in bilberry. They appear to provide antioxidant protection to the nervous system. Grape skin contains anthocyanins that have been linked to maintaining healthy cardiovascular function. 20 mg vitamin C (35% of Daily Value), grape seed extract, pine bark extract, grape skin extract, broccoli flowers, carrot root, red beet root, rosemary leaves, tomato fruit, turmeric root, cabbage leaves, grapefruit and orange bioflavonoid extracts, and hesperidin. Take 1 tablet with a meal three times daily.